► C-class Coupe on steroids! Last week we brought you the first official pictures of the upcoming Mercedes C-class Coupe, now we can reveal the new, top-dog AMG C63 and its sibling, the C63 S, which looks to pip the last generation's title as the highest-selling AMG C-class. Mercedes says the only things the AMG coupe shares with its regular C-class models are the doors, roof and boot lid, with a fresh, more muscular bodykit. See it at the Frankfurt motor show on 15 September 2015. Wide arches, discreet spoiler and larger alloys – it’s a C-class Coupe on steroids! The AMG C63 AMG models both get substantial upgrades over the regular coupe, according to Mercedes. It sits a whole 64mm wider at the front, and 66mm at the rear; this allows Mercedes to fit 255/40 R18 tyres on the front, and 285/35 R18 boots at the rear, with the C63 S getting larger 255/35 R19 front and 285/30 R19 rear tyres for increased traction. Car spotters take note: the regular C63 Coupe gets 10-spoke rims, the C63 S comes with five-twin-spoke alloys. Various muscular features will help identify the C63 from its regular C-class siblings, with the bonnet being 60mm longer and bulging with a power dome to fit all the turbo V8 plumbing in. A front splitter is designed to cut the air in order to reduce front-axle lift, while a discreet spoiler and rear diffuser trim rear-axle lift. 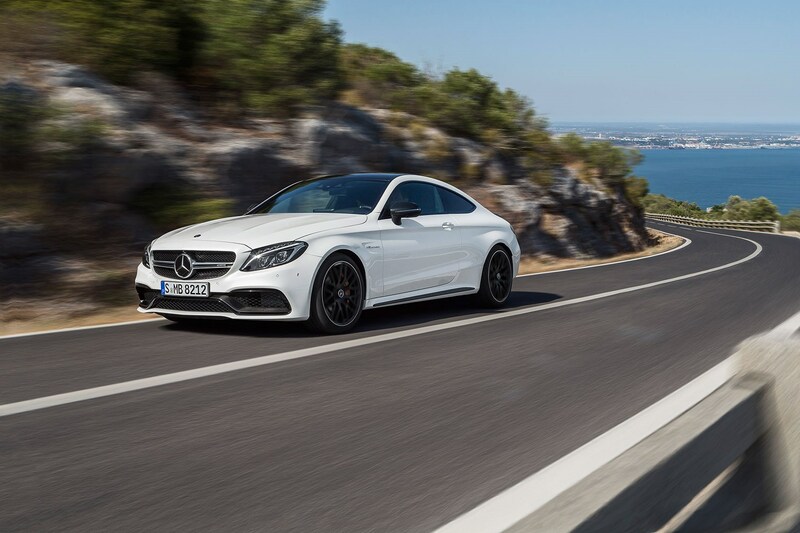 Four driving modes are available on the C63 AMG Coupe, ranging from Eco to Sport+, with an individual setting. The C63 S model gets an extra ‘Race’ mode, too! As we all knew, the AMG C-class coupe will get the 4.0-litre V8 bi-turbo unit featured in the saloon. Power is up to 476bhp and 479ft lb of torque, whilst the C63 S gets a whopping 503bhp and 516ft lb. According to Mercedes, this will propel the two-door from 0-62mph in 4.0sec and 3.9sec respectively. Both top out at the electronically limited 155mph, but with the optional extra AMG Driver’s Package, an 180mph governor is fitted. All that power is pushed through a seven-speed twin-clutch auto. It's refreshing to know that Mercedes has fitted a mechanical limited-slip differential (LSD) to the C63 (the S model comes with an electronic LSD to control inner wheel motion during fast cornering). An electronically controlled ‘flap’ system comes as standard within the exhaust, letting you choose your degree of lairiness. The ‘flaps’ are mapped to driving modes, with Sport+ opening the valves for a louder experience, and Eco keeping certain valves closed for a more muted drive.